I hope you all had an enjoyable weekend. I was able to celebrate my friend Jasmine's birthday with her on Sunday over brunch and that was pretty fun. I love Jasmine so I love seeing her happy and surrounded by people who love her as much (well almost) as I do! (: The rest of the time was just really relaxing. My father in law came in town this weekend, and my husband and I really enjoyed spending time with him just talking and catching up. He has always been so nice and welcoming to me, so I'm glad he got to see our new home and spend some quality time with my MJ. I thought it was really cute that he and my husband spent some bonding time installing our new blinds on Saturday. :) My husband now feels like he needs a giant tool belt with all the trimmings! Actually, I think it's just something about being a homeowner that makes men want to fix stuff! haha Can any of you ladies relate?! My thoughts are as long as he doesn't tear up the house, I'm good with it! Anyway, we had a pretty chill weekend overall and when this post goes live, I'll be back at work slaving away. I wanted to share with you guys just some random thoughts that have been in my head lately, so I hope you don't mind the venting! So, I'm back in Illinois now for another jam packed work week, but it's all good! I'm just taking every day as new learning experiences and I'm learning to roll with the punches. If I don't, I'll just be down all the time and that's no way to live! Besides, I'm super blessed y'all! I've been complaining about the circumstances of my job, but some people don't have a job at all. Not only do I have a job, but they fly me to Illinois every single week, put me up in a pretty nice hotel, I get a car, and per Diem. It's pretty sweet and if I was single, I probably wouldn't get as sad about it because I wouldn't have a husband back home missing me and I missing him! Overall, I'm just trying to do a better job of counting my blessings instead of the things I don't like. I consider myself to be a pretty grateful person, but when I complain about things that aren't exactly going my way, that doesn't reflect me being grateful. It's pretty hard to see things in that way when you're in the midst of your own personal "storm", but remembering that my storm is a baby wave compared to some people's hurricanes keep me grounded. I've been learning to find happiness in the little things too! Y'all ever think about how great it is that you can eat what you want to eat when you're hungry?! That is a BLESSING! Everybody isn't able. Seriously. What about when you take a shower... are you using your favorite soap?! BLESSING! Some people can't buy their favorite soap! those shoes are so fab! I love them with the red dress too! oh my gosh! obsessed with your shoes and that handbag. 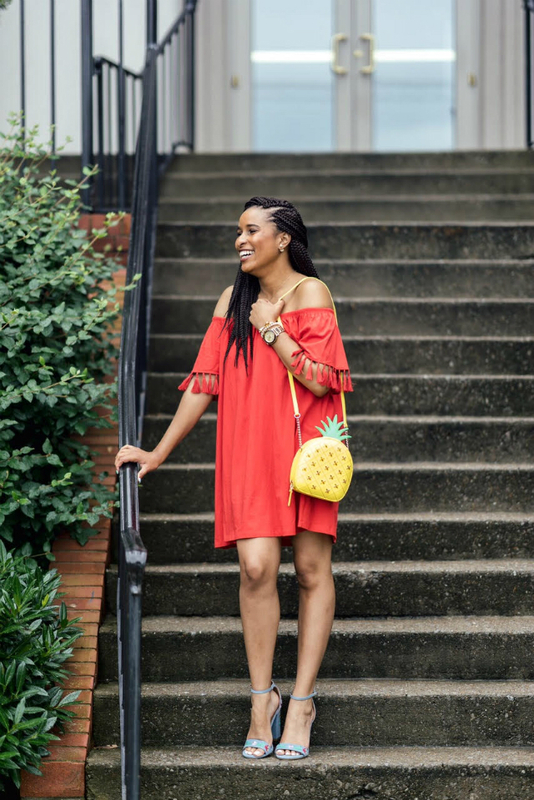 How cute is that pineapple bag!! Love your outfit and those heels are so fun! 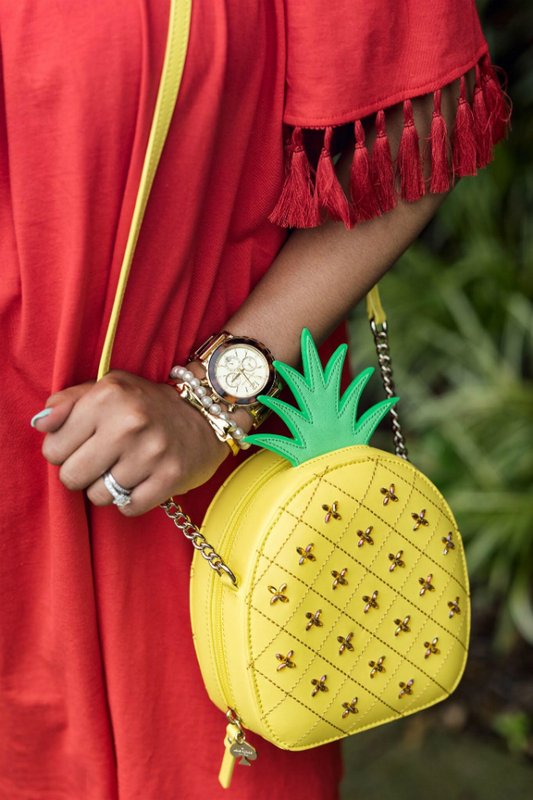 LOOVE this pineapple bag- need it for myself!! 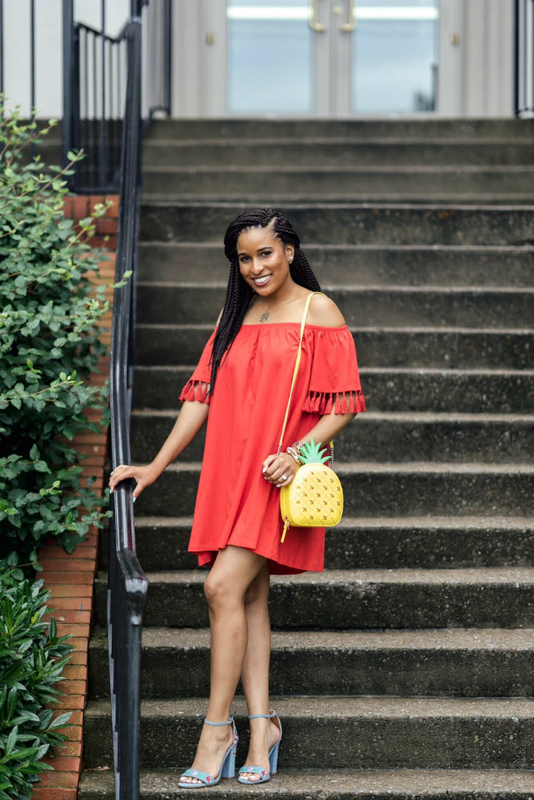 I love that pineapple purse, its so fun for summer! I saw that bag in the outlet a few weeks ago - now I REALLY want to go back and get it LOL! This is a gorgeous look! 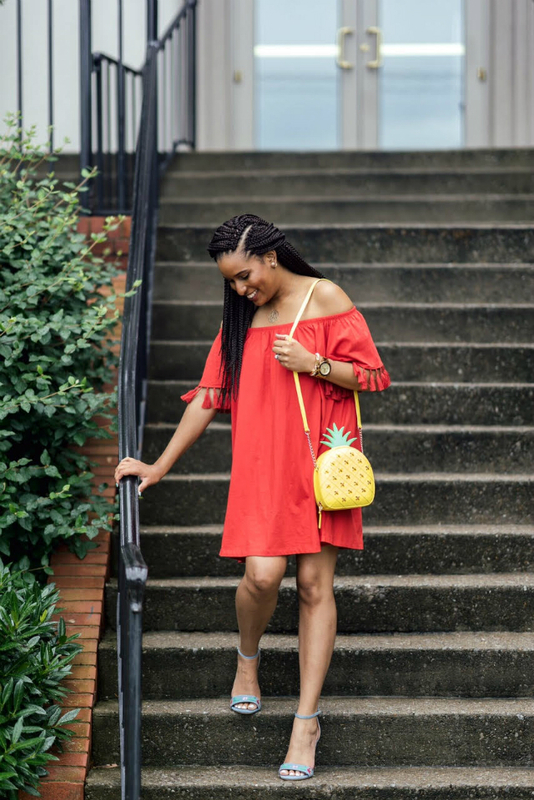 This pineapple bag is adorable! 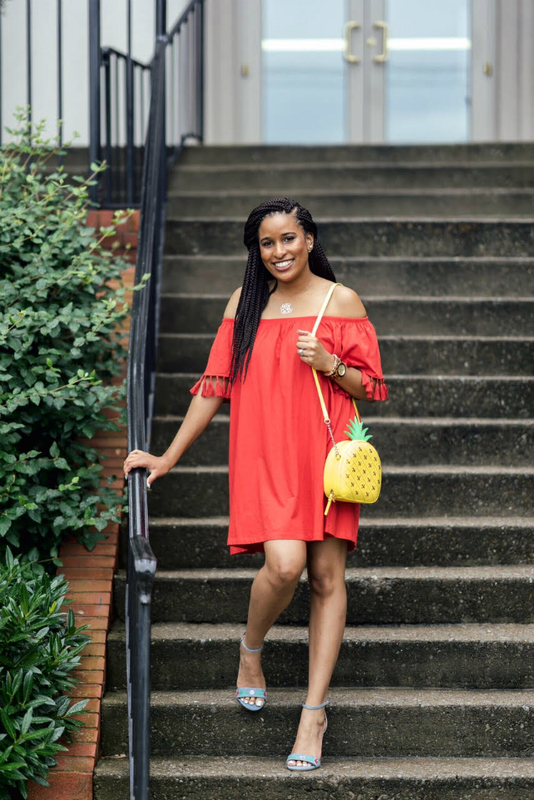 And I love your red dress - definitely on my fall trend list!